Today is the last day of the blog hop. I recently got this sentiment stamp which pretty much sums up how I cope with life. The ants not only convey summer, but the inevitability of problems that either need to be dealt with or endured. That’s life, folks! Supplies: Verses Lots of Laughs stamp, Doodlebug Picnic Ants stickers, Simon Says stamp coffee die and Adult Beverages die set, Paperhouse At the Vinyard patterned paper, Reverse Confetti All Framed up die, Lawn Fawn Make me smile die, Alideco washi tape, My Favorite things Abstract Art stamp set, Hero Arts Painted circle stamp,Simon Says stamp card base and Scor tape. Sandra and I took a little trip (if you can call 2400 kilometers little) down to Phoenix. I needed to get my car down there before the snow flew as it is strictly a summer car and since our respective partners were working (Ha Ha) off Sandra and I went. We had a fabulous time in Utah taking in Canyonlands and Arches National Parks as well as the scenic drive through the Monument Valley. That trip is my excuse for not having posted to the blog in over a week. Today, though, I wanted to post a couple of cards that I am very excited about. I could hardly contain myself when I saw the new release from Neat and Tangled. 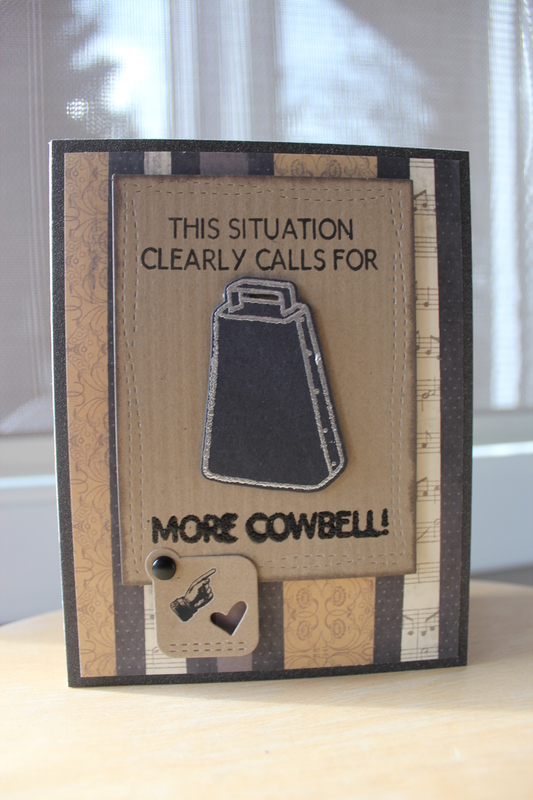 They came out with a stamp and die set entitled More Cowbell! Yup straight from one of the most famous skits ever on Saturday Night Live! My three sons, in their younger years, would quote this skit often and for them, just about every situation that arose in our house called for “more cowbell”. 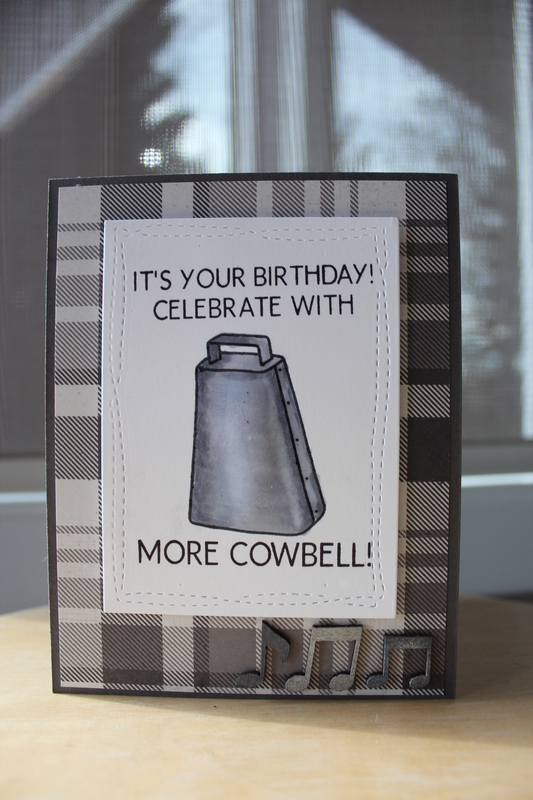 Two of my three sons have birthdays coming up, so they are definitely going to have “more cowbell” on their Birthday cards. Supplies: Neat and Tangled Cowbell stamp and die set, Avery Elle Wonky Stitches die set, Karen Foster patterned paper, Tim Holtz Remenent Rubs, Recollections cardstock, Stampendous Silver embossing powder, Emerald Creek Craft Company Onyx Frost embossing powder, Unknown glitter paper. Photoplay Mad for Plaid patterned paper, Unknown wooden musical notes, Pico embellisher in clear, Hero Arts Ombre pigment ink, and Scor tape. I am enrolled in the new Wild Card class. 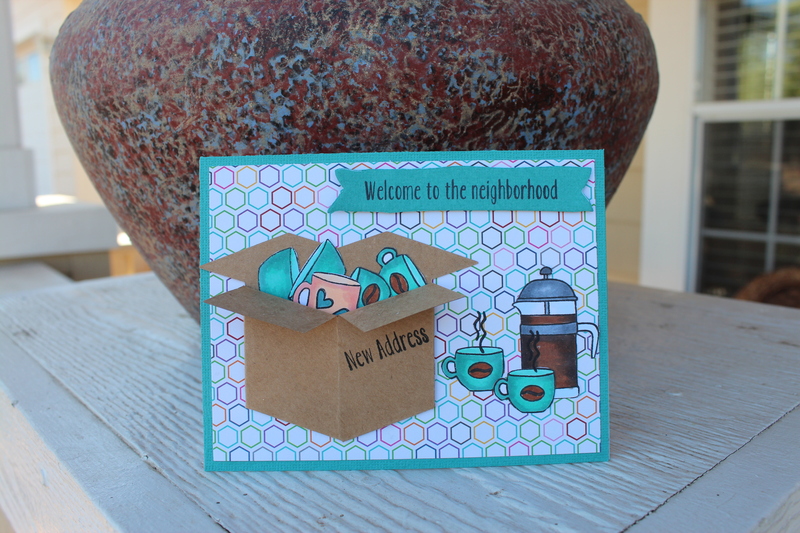 In this class the emphasis is on unusual cards as to shape, dimension, interaction or the like. Today, I started out by making a shaped card with a 3D box for it to sit on. I have started to think about Margaritas as it is getting to be time to head down to Rio Mirage Cafe in El Mirage. So ok, it is 2400 km to get there, so I won’t make it in time for Happy Hour today….but soon my friends………soon. I was introduced to this group the last time they had a blog hop. With over 50 sponsors, I thought I had a good chance of winning a prize, but no, somehow my number did not come up. I was lucky though as I saw Jane’s Doodles cards for the first time. Now being the proud owner of a Jane’s Doodles stamp set, here is my entry to the blog hop. 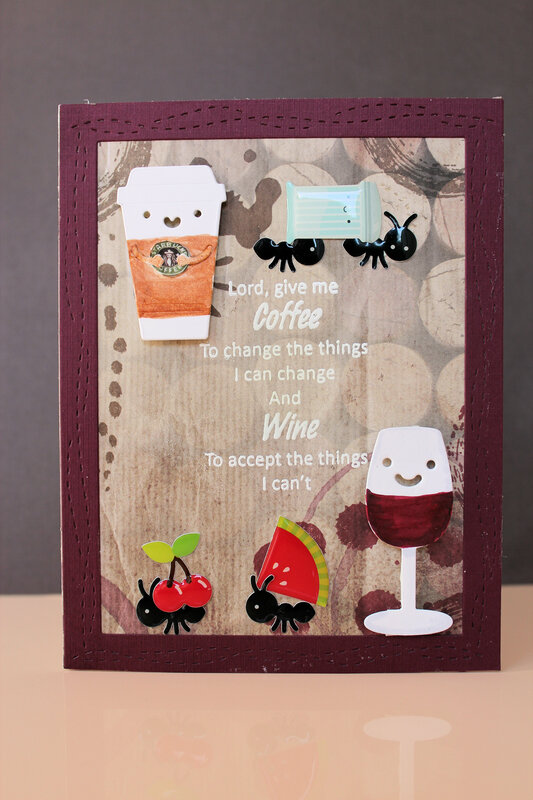 The card I made for the latest Avery Elle Challenge is a bit of an unusual one for me. On the card there is a mix of a cartoonish whimsical stamp with a realistic stamp. I also added in lots of shiny metallics. The mix of these elements would not usually work for me, but in the end I was happy with the resulting card. 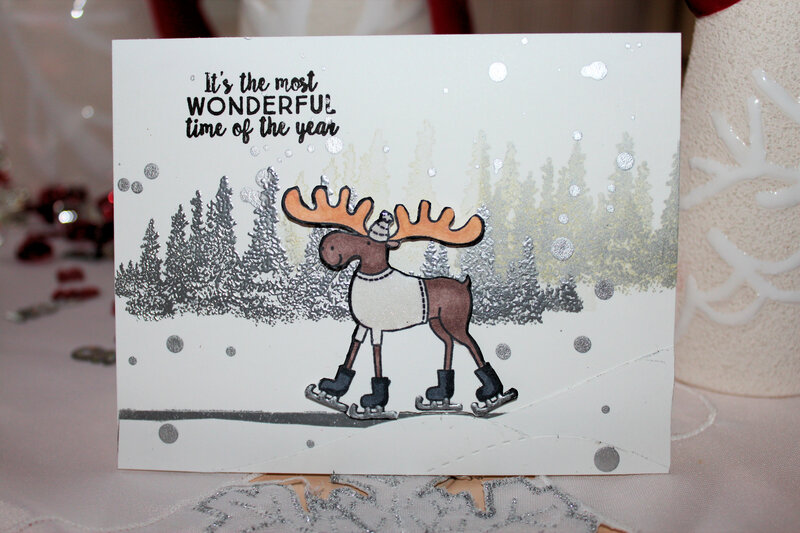 Supplies: Avery Elle Snow much Fun stamp set, Stampendous embossing powder, Hero Arts Silver dye ink, Tim Holtz Brushed Pewter stain, River City Rubberworks Forest stamp, Simon Says tamp card base, Copic markers, Simon Says stamp Stitched Slopes and Hills and Scor tape. Oh What fun I had making this one! I have had this idea for the current Avery Elle Tag Challenge rolling around in my head for a while. The problem was I didn’t have an Avery Elle stamp with critters on it. My mailman came to the rescue yesterday with my order from Simon Says Stamp. Not only was there a stamp set with critters on it, but also, they were wearing toques! To add to the fun, there were plenty of small sentiments that I could use together on the matching tags. Perfect. Here is the resulting tag pair. 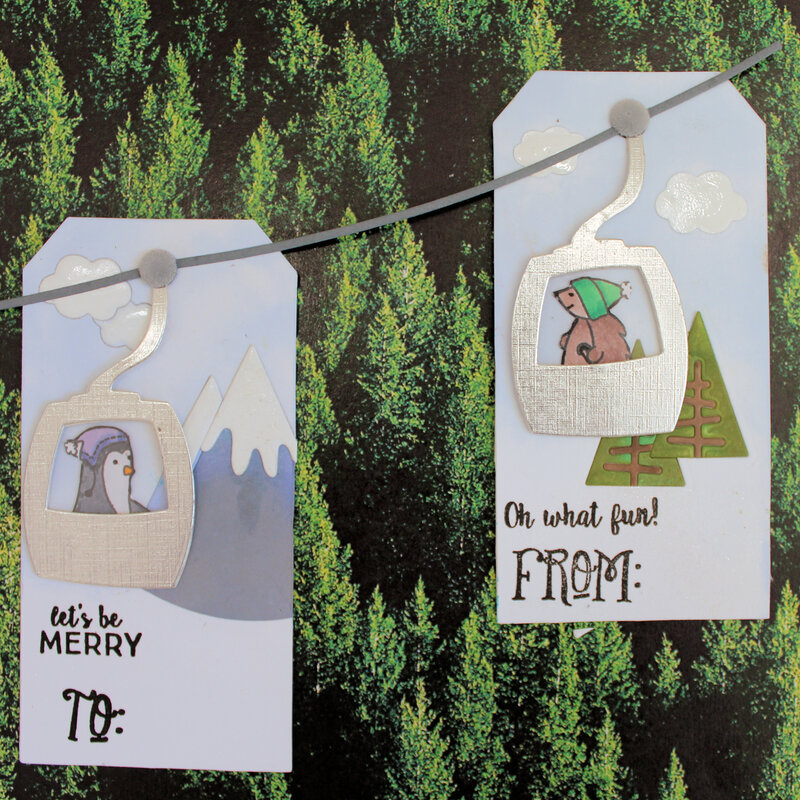 You have to picture how cute these tags would look together on the top of a present with something like the background paper as the wrapping paper. Stinkin Cute, I’d say. Avery Elle Snow Much Fun and Seasonal Sentiments stamp sets, Avery Elle Snow Caps die, Hero Arts dye inks, Creative Imaginations Shimmer Spritz, Imagine Crafts Wedding Dress Pico Embellisher, Judikins acetate, Unknown velvet brads, Neenah 80 lb cardstock, Tim Holtz tag die, Tombow and Zig e way adhesives. Check out the next post to see Debbie’s entry into the Challenge. 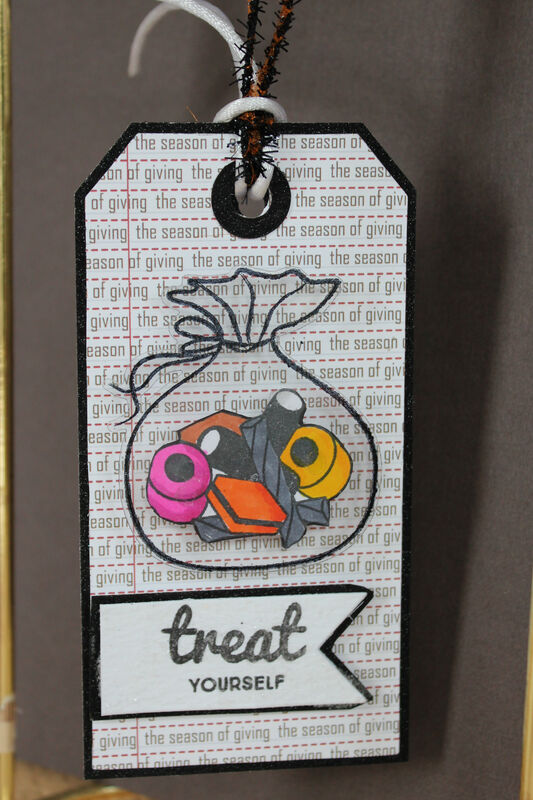 Avery Elle Pick “N” Mix stamp set, Tim Holtz Tag die, WeR Banners die, Judikins Window Plastic, Stazon Jet Black ink, Teresa Collin Santa’s List 6X6 patterned paper, Ranger Rock Candy Stickles, unknown black glitter cardstock, Michaels and Maya Road ribbon and Scor tape.